මගේ පීතෘ භූමිය, මගේ සතුට සහ ප්‍රීතිය"
a. මහාධිකරණය සහ එක් අමාත්‍යාංශයක් ටාටු වල පිහිටා ඇත. b. ව්‍යවස්ථාව අනුව එකම නිළ භාෂාව එස්ටෝනියන් භාෂාවයි.දකුණු ප්‍රාන්ත වල Võro සහ සෙටො භාෂා ද, Ida-Virumaa සහ ටලින් වල රුසියානු භාෂාව ද මේ සමඟ භාවිත වේ. c. 5.4% Võros සහ 0.93% Setos. d. SDE member but nonpartisan while in office. e. 47,549 km2 (18,359 sq mi) were defined according to the Treaty of Tartu in 1920 between Estonia and Russia. Today, the remaining 2,323 km2 (897 sq mi) are part of Russia. The ceded areas include most of the former Petseri County and areas behind the Narva river including Ivangorod (Jaanilinn). Pechory remains under Russian administration. එස්ටෝනියාව ( i/ɛˈstoʊniə/; එස්ටෝනියානු: Eesti [ˈeːsti])නිල වශයෙන් හඳුන්වනු ලබන්නේ එස්ටෝනියා සමූහාණ්ඩුව (එස්ටෝනියානු: Eesti Vabariik)නමිනි. මෙය උතුරු යුරෝපයේ බෝල්ටික් කලාපයේ පිහිටි රටකි. එහි දේශසීමා වන්නේඋතුරින් ෆින්ලන්ත මුහුදු බොක්ක (Gulf of Finland)ත්, බටහිරින් බෝල්ටික් මුහුදත්, දකුණින් ලැට්වියාවත්, නැගෙනහිරින් පීපස් විල (Lake Peipus) සහ රුසියාවත් වෙයි. එස්ටෝනියාව සහ ලැට්වියාව අතර දේශසීමාවෙහි දිග 343 km වන අතර එස්ටෝනියාව සහ රුසියාව අතර දේශසීමාව දිගින් 338.6 km ක් වේ. බෝල්ටික් මුහුදට එපිටින්, ස්වීඩනය බටහිර දෙසින් ද, උතුරින් ෆින්ලන්තය ද පිහිටා ඇත. එස්ටෝනියානු භූමි ප්‍රදේශය, ප්‍රධාන භූමියට අමතරව බෝල්ටික් මුහුදේ පිහිටා ඇති දූපත් 2222කින් සමන්විත වෙයි. එහි සමස්ථ වර්ගඵලය 45,339 km2 (17,505 sq mi) වෙයි. එස්ටෝනියාවේ තෙත් මහාද්වීපික දේශගුණයක් පවතී. ක්‍රි.පූ. 6,500 ට පමණ පෙර සිටම එස්ටෝනියානු භූමියේ පදිංචිකරුවන් සිට ඇත. නූතන එස්ටෝනියානු භාෂාවේ ආදි නෑයින් වන ෆිනො-යූග්‍රික් (Finno-Ugric) බස කතා කල මිනිසුන් එස්ටෝනියාවට පැමිණියේ ක්‍රි.පූ. 1800 ට පමණ පෙරාතුවය. අනුක්‍රමිකව ශතවර්ෂ ගණනාවක් තිස්සේ ටියුටෝනික, ඩෙන්මාර්ක, ස්වීඩන් සහ රුසියානු පාලනයට යටත්ව සිටි එස්ටෝනියානුවන් තුළ ජාතික පිබිදීමක් ඇතිවීම නිසා පළමු ලෝක යුද්ධය අවසාන වන විට රුසියානු අධිරාජ්‍යයෙන් නිදහස හිමි කර ගැනීමට එස්ටෝනියාව සමත් විය. දෙවන ලෝක යුධ සමයේ (1940) දී සෝවියට් සංගමය විසින් එස්ටෝනියාව අත්පත් කර ගන්නා ලදී. ඊට වසරකට පසු නාසි ජර්මනිය විසින් ද, නැවතත් 1944 දී සෝවියට්වරු විසින් ද එස්ටෝනියාව අත්පත් කර ගන්නා ලදී. එතැන් පටන් එය හැඳින්වුණේ එස්ටෝනියන් සෝවියට් සමාජවාදී ජනරජය (Estonian Soviet Socialist Republic) ලෙසටයි. 1988 ගායන විප්ලවය (Singing Revolution) සමයේ දී නීතිවිරෝධී සෝවියට් පාලනයට විරෝධය පළකරමින් එස්ටෝනියන් SSR විසින් එස්ටෝනියානු ස්වෛරීත්වය පිලිබඳ නිත්‍යානුකුල අයිතිය ඉල්ලා සිටින ලදී. 1991 සෝවියට් කුමන්ත්‍රණ ප්‍රයත්නය මධ්‍යයේම, 1991 අගෝස්තු 20 දින රාත්‍රියේ දී එස්ටෝනියාවේ ස්වාධීනත්වය යළි ස්ථාපනය කරන ලදී. නූතන එස්ටෝනියාව පාර්ලිමේන්තුමය ප්‍රජාතන්ත්‍රවාදී ජනරජයකි. එය ප්‍රාන්ත 15කින් සමන්විත වෙයි. එස්ටෝනියාවේ අගනුවර මෙන්ම විශාලම නගරය වන්නේ ටලින් (Tallinn) ය. මිලියන 1.3 ක ජනගහණයක් සහිත එස්ටෝනියාව, යුරෝපා සංගමයේ, Eurozone හි, NATO හි, OECD හි සහ Schengen ප්‍රදේශයේ අවම ජනගහණයක් රටවල් අතුරින් එකක් වෙයි. ↑ "Rahvaarv rahvuse järgi, 1. jaanuar, aasta". Statistics Estonia. සම්ප්‍රවේශය 10 June 2016. 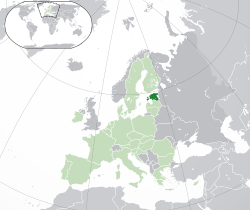 ↑ "ESTONIA – Look and you will see!" (PDF). සම්ප්‍රවේශය 27 July 2015. ↑ "PHC 2011 RESULTS". Statistics Estonia. සම්ප්‍රවේශය 26 ජනවාරි 2016. ↑ 5.0 5.1 5.2 5.3 "Estonia". International Monetary Fund. සම්ප්‍රවේශය 25 අප්‍රේල් 2016. ↑ "Gini coefficient of equivalised disposable income (source: SILC)". Eurostat Data Explorer. සම්ප්‍රවේශය 5 January 2014. ↑ "2015 Human Development Report" (PDF). United Nations Development Programme. 2015. සම්ප්‍රවේශය 14 December 2015. ↑ "United Nations Statistics Division- Standard Country and Area Codes Classifications (M49)". Unstats.un.org. 31 October 2013. සම්ප්‍රවේශය 31 March 2016. ↑ Häkkinen, Jaakko (2009). "Kantauralin ajoitus ja paikannus: perustelut puntarissa. – Suomalais-Ugrilaisen Seuran Aikakauskirja" (PDF). p. 92. ↑ "Estonian Economic Miracle: A Model For Developing Countries". Global Politician. Archived from the original on 28 June 2011. සම්ප්‍රවේශය 5 June 2011. ↑ "Press Freedom Index 2016 – Reporters Without Borders". En.rsf.org. සම්ප්‍රවේශය 29 May 2016. මේ පිටුව අන්තිමට සැකසුවේ 14 අගෝස්තු 2016 දින දී, 09:14 වේලාවෙහිදීය.